This time of year, all I want to do is drink a warm drink, carve pumpkins and bake comfort foods. I was looking through the recipe book my Granny made for me to find a recipe that would suit the season. Enter: the Caramel Coffee Ring. 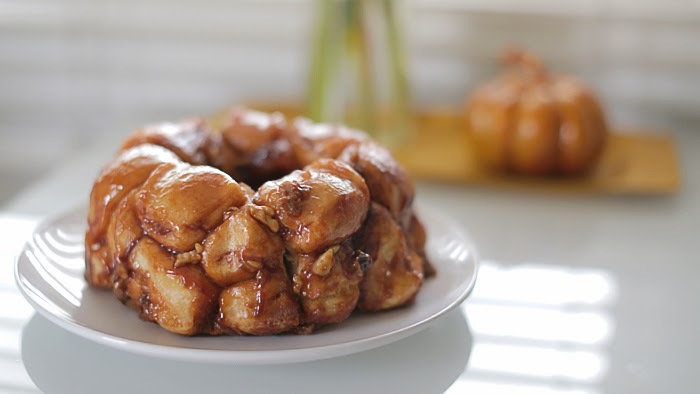 Can you say “nomnom?” It was easy to make and the taste reminded me of a Cinnabon (which is not always the best thing for me since I worked there and am scarred for life when it comes to cinnamon but if you like Cinnabons, you’re gonna love this). 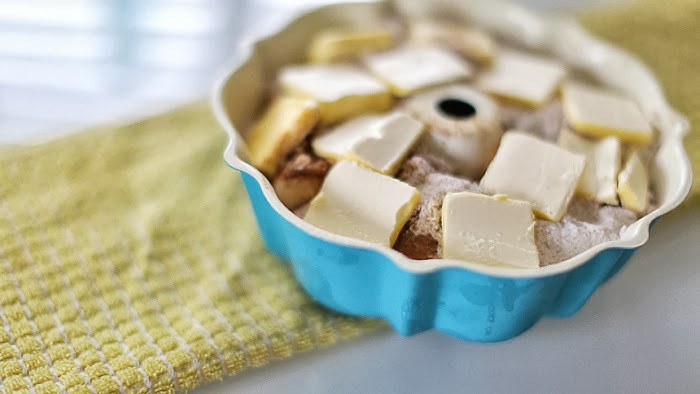 Layer frozen rolls in greased bundt pan. 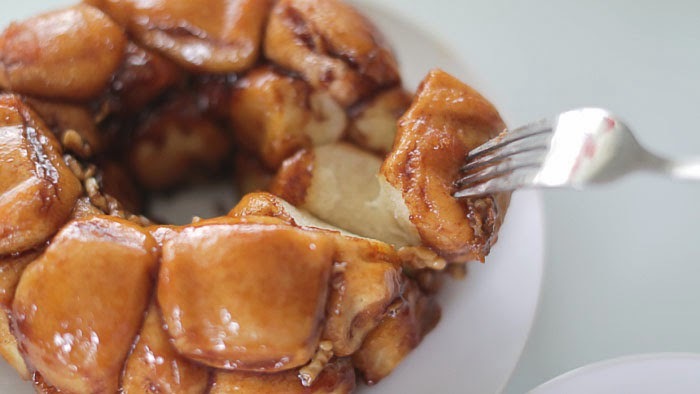 Mix cinnamon with sugar and pour over rolls. Layer one at a time : nuts (optional – I put them on half because J doesn’t like them), brown sugar, pudding mix. Slice butter on top of rolls. Cover pan. Let rise over night in fridge. (Mine actually didn’t defrost all the way over night so I let them sit for a couple hours on the counter in the morning so they fully defrosted and rose). Bake at 350 degrees for 35-40 minutes. (I recommend putting a cookie sheet under the bundt pan because it will likely spill over). Invert pan, let sit for a few minutes, then remove. umm, yeah, this looks freaking amazing! Never mind the delicious snack! Engagement?! Congratulations! This looks amazing, perfect for fall. I may have to try out the recipe myself, my mouth is watering just thinking about it! This just looks delicious, the picture alone is mouthwatering! Really shouldn’t have looked at this around my mid morning coffee break! Yuuuum! very tempting and looks beyond delicious..
Yummm, this looks delicious! Though I’m not sure we have dinner rolls in the UK, like most things! I think I need to move to the US! This is a Christmas morning tradition at our house. I would love to try it to myself. They are a very reliable provider that provides amazing client support, distribution and The Best Coffee Maker Reviewassurance services. This vendor loves close connections with all the top produces so they are able to provide you the best on-line provides and also provide a free 2 year assurance on the product. It looks sooo tasty! =) Well I try to eat only natural and healthy products, like lots of fruits, vegetables, berries, meat/fish, dairy products and avoid fast-food, and drink much water. But I can’t live without sweets! It’s my passion and my biggest problem. I’d eat sweets all day long if I could. And I know already, that I’ll try this recipe. But I use these calculators for losing weight, it helps me to keep fit and eat something tasty one a week. Plus I do exercises on a regular basis of course and I feel great.